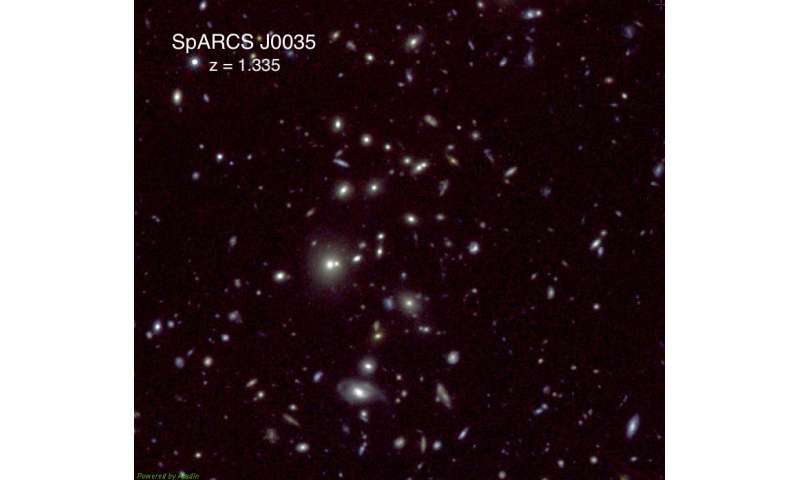 Hubble Space Telescope image of one of the SpARCS clusters used in the study, seen as it appeared when the universe was 4.8 billion years old. Credit: Jeffrey Chan, UC Riverside. It has long been known that when a galaxy falls into a cluster, star formation is fairly rapidly shut off in a process known as "quenching." What actually causes the stars to quench, however, is a mystery, despite several plausible explanations having been proposed by astronomers. Each galaxy entering a cluster is known to bring some cold gas with it that has not yet formed stars. One possible explanation suggests that before the cold gas can turn into stars, it is "stripped" away from the galaxy by the hot, dense gas already in the cluster, causing star formation to cease. Another possibility is that galaxies are instead "strangled," meaning they stop forming stars because their reservoirs cease getting replenished with additional cold gas once they fall inside the cluster. This is predicted to be a slower process than stripping. A third possibility is that energy from the star formation itself drives much of the cold gas fuel away from the galaxy and prevents it from forming new stars. This "outflow" scenario is predicted to occur on a faster timescale than stripping, because the gas is lost forever to the galaxy and is unavailable to form new stars. "Comparing observations of the quenching timescale in galaxies in clusters in the distant universe to those in the nearby universe revealed that a dynamical process such as gas stripping is a better fit to the predictions than strangulation or outflows," Foltz said. "Thanks to the phenomenal investment in our work by these observatories, we now believe we have a good idea of how star formation stops in the most massive galaxies in clusters," said Gillian Wilson, professor of physics and astronomy at UCR and leader of the SpARCS survey, in whose lab Foltz worked when the study was done. "There are good reasons, however, to believe that lower-mass galaxies may quench by a different process. That is one of the questions our team is working on answering next." "as well as hot gas and" bull chit. Essentially the electric currents injecting plasma into these galaxies gets interrupted, got it. Nope, you just made that up. As usual. Stick to Velikovskianism, yes? Whenever they stick dark matter into a theory you know it's probably wrong. And whenever DM is mentioned, pound to a penny, some crank will show up insisting it doesn't exist. And, also pound to a penny, when pressed, said cranks will admit that they have no viable alternative to DM. When dark matter is mentioned in an article, candrive85's ego explodes with a force so great, it strips away gas from would-be stars in far off galaxies. Murderer! Is that my ego or my backside? Temperature is the average of molecules vibrating. A net effect of E&M like temperature could be; a tug towards the center that keeps galaxies from tearing apart from their velocity. Not the lorentz forces from a very very weak galactic magnetic field, but a net effect currently UNKNOWN. The evidence is that galaxies do not fly apart. The evidence required is an entire galaxy of matter to see a more than nominal E&M effect. I'd buy this simple simple assumption over crazy dark matter any day.